Emirates has confirmed it will resume its recently suspended third daily Dubai-Sydney service in 2011, with services to resume from October 2 operated by Boeing 777-300ERs. Emirates suspended its third daily service, with was operated by Boeing 777-200LRs, last month as part of a reorganisation and reprioritisation of its aircraft and resources. The 777-300ERs will be configured with eight first class suites, 42 lie-flat business class seats, and 304 seats in economy. 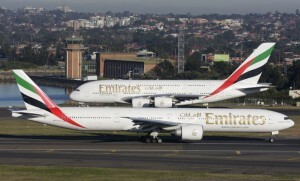 Emirates says it has increased its Australian capacity over the last two years by 25 per cent per annum.